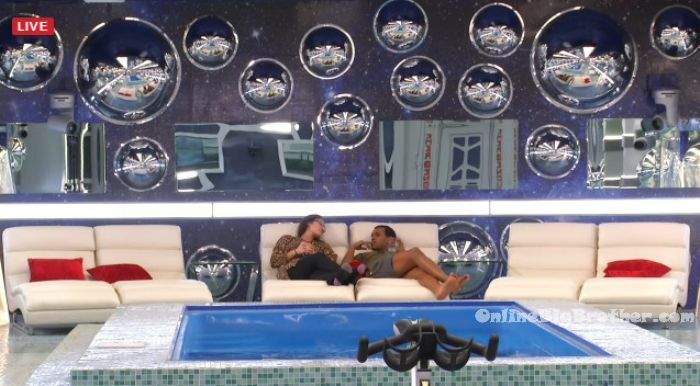 1:50am HOH room – Demetres and Ika are talking. Ika is telling him about how in the beginning the vets wanted to stick together. 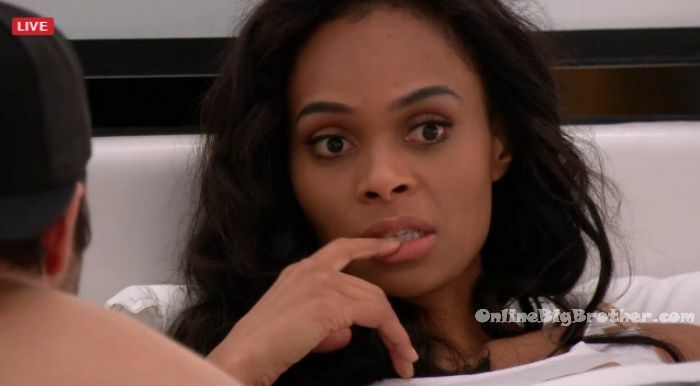 Ika explains with the first eviction – I wanted to keep you and Neda wanted to keep Mark. And Cindy wanted to keep Mark for obvious reasons. I didn’t. I felt like if you stayed we could work together. You got really close to Cass and they thought Cass wanted to keep you to go after them. Cass interrupts them to use the bathroom. After she leaves Ika continues telling Demetres everything. They thought you were with her (Cass). I did not want you to go home. Kevin was crying wanting to keep Mark. Dallas was crying. I’m just trying to let you know where my hatred is coming from. Kevin was sitting there and I asked you want to flip the vote? And he was like yes. And I was like – you don’t want to keep him (Demetres)? And he was like – no I have a bad feeling. That’s when it was confirmed that he lied to me upstairs. Bruno whispered to me that Mark told me that Cassandra told him that you and Gary.. pretty much that he threw mine and Gary’s name under the bus. Neda and Cindy .. yeah I trust because they saved me the vote. That’s why I had so much anger for Bruno and Kevin. Now they’re bouncing for joy… they pretty much like you more than Cindy. Neda says that Cindy has such loose lips. Ika – now we pretty much have the 6 person alliance. They think its a 4 person alliance. Ika – I knew .. I just had a feeling that you would be loyal. Even Neda, I didn’t know if I could trust her. At that time I trusted you way more than them. Ika – Cassandra is a snake. She wanted to keep you but for selfish reasons. Just like how she wants to keep Dallas. Ika – nobody likes Cassandra. The only thing that is solid right now is like You, Neda, Cindy, Kevin, Bruno and you know how we feel about them and then you. And its not like its a vet thing .. its a solid thing. Like if I felt like it was like a vet thing I would tell you. Demetres – I honestly don’t think I’m at the bottom of that alliance at all. Ika – I promise you, you’re not. Ika – leaves to go to bed. 2:50am – 3:15am By the pool – Gary and Cass chatting about the house guests and what they think of each of them. After their chat they head inside because they’re worried they’ll be locked out in the backyard. The find Kevin wide awake in the kitchen. Ah nevermind. Just saw it all from the 17th. So Ika is saying how Sindy talks to much as she splills everything to Dem … Hey Ika you fool … look in the mirror. I never did like or trust Ika, can’t wait till she’s out. not much happening this morning.. video posts will be later today.